Quiznos has a great new offer. If you missed the coupons in last Sunday’s newspaper, you can print them directly from Quiznos now. No registration required, just print away. 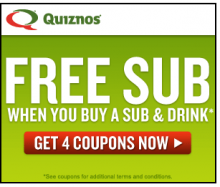 Quiznos: Four new printable coupons! I love this Quiznos offer and glad it’s back! 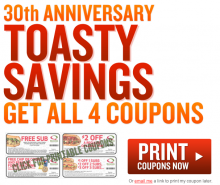 Quiznos subs just released four new printable coupons. Head over to Quiznos to print these great coupons while they last. Here are four great printable Quiznos coupons for you to print and use. I love to have these on hand for when I’m out and about. Did you get the $10 in Quiznos coupons on your paper? 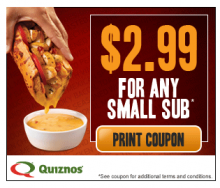 Wow, Quiznos is dishing out the coupons today! 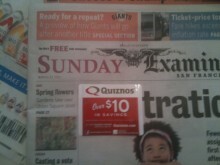 On my Sunday Examiner there was a coupon packet for $10 in Quiznos coupons. I posted the $2.99 Small Sub coupon offer earlier today. These are great coupons just in time to take the family out today! If you didn’t have the $10 in your paper, make sure you print the $2.99 coupon here! 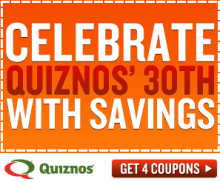 Coupons Mar 27, 2011 in food, Quiznos · Expired! The Quizno’s Rib Sub for $2.99 coupon is back! Hurry over to Quizno’s and grab this coupon for a Rib Sub for only $2.99. This coupon won’t last long, print your Quizno’s coupon before it’s gone. Quizno’s Coupon: Sub, chips, and drink for $2.99! I love Quiznos toasty subs. I love this offer even more! Here is a Quiznos coupon for any small sub, chips and regular fountain drink for only $2.99. This coupon is valid through 7/26 only! Coupons Jul 21, 2010 in food, Quiznos · Expired! I love Quiznos toasty subs! Here is a Quiznos coupon for any small sub, chips and regular fountain drink for only $2.99. Coupon valid through 6/14 only! Coupons Jun 11, 2010 in food, Quiznos · Expired! Here are two new coupons for Quiznos for subs, soups and salads. Have you tried their Chopped Salads yet? Yum! Coupons Mar 11, 2010 in food, Quiznos · Expired! Join Quiznos sub club and you’ll get a $2 off one sub sandwich coupon. Also, they’ll send you a coupon for a free cookie on your birthday! Take a few seconds and join Quiznos QC Club today.